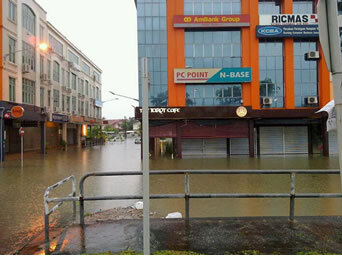 Parts of Kuching experienced flash floods today with many arriving at work later than usual. On Twitter, the hash tag #KuchingFloods saw motorist updating each other on the flood situation in Kuching, with Hui Sing, Kenyalang, Satok, Sg Maong, Batu Kawah and Kpg Gita all reported to have flash floods. It was reported also that 2 went missing in Batu Lintang, and that search and rescue operations have already begun, while not less than 2 schools were forced to closed due to the rising water.